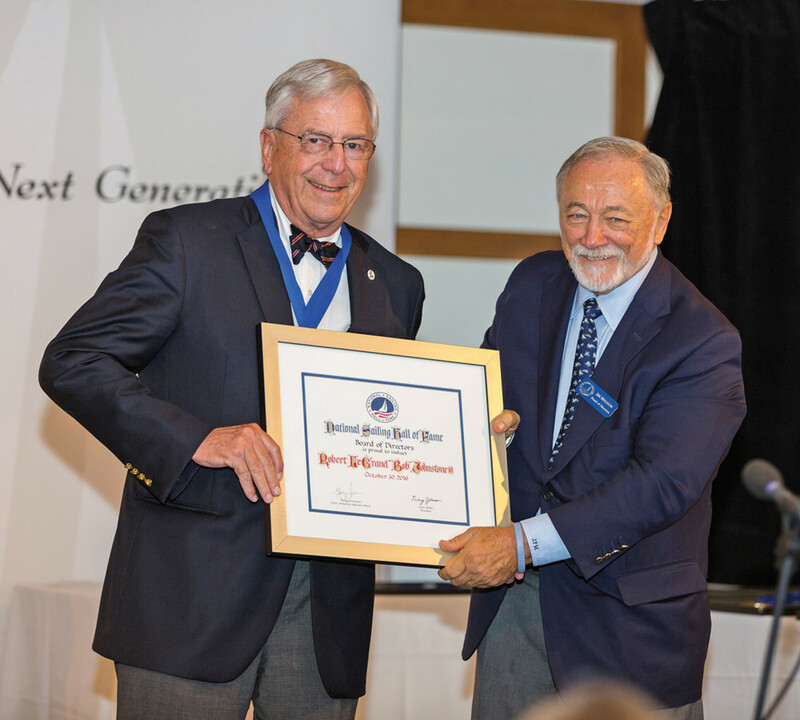 Bob Johnstone (left) gets his certificate from National Sailing Hall of Fame vice president Jim Muldoon. Rod and Bob Johnstone independently arrived at the same conclusion 39 years ago before launching the perennially popular J/24: The wave of baby boomers who were having so much fun sailing Hobie, Sunfish and other beach boats were marrying and having children and were primed for owning a performance family keelboat. Rod, a writer, photographer and ad salesman for Soundings magazine in 1974, already was building one for himself and his growing family in his garage in Stonington, Conn.
Bob, transitioning to the marine business after 17 years in marketing and operations at Quaker Oats Co., had become marketing vice president at AMF Alcort, the maker of Sunfish, Hatteras, SlickCraft and Wellcraft. He had not been able to convince the corporate brass that the market was aching for a versatile, easy-to-sail racer, cruiser and daysailer that was family-friendly and fun to race and take friends out on. Rod launched Ragtime in 1976 and cleaned up on the race circuit, winning 15 or 16 races that summer, Bob recalls. The design was a winner, so with $20,000 in seed money the brothers formed a partnership, J/Boats, enlisted boatbuilder Everett Pearson as their builder and in 1977 took the design of Rod’s 24-foot Ragtime to market. Soundings publisher Jack Turner gave the Johnstones three free full-page ads to start. After six months, their fledgling company had taken orders for several hundred boats. By the end of 1977 the order book had grown to 700, and Pearson was turning out 30 boats a week, with six sets of tooling and six assembly lines. The J/24 was the first of J/Boats’ 40 designs — altogether there have been 14,000 boats built, including 5,700 J/24s. After a lifetime of building and racing boats, Bob, 82, who lives in Newport, R.I., and Rod, 79, a Stonington, Conn., resident, took home an armload of silver this fall for their contributions to sailing. 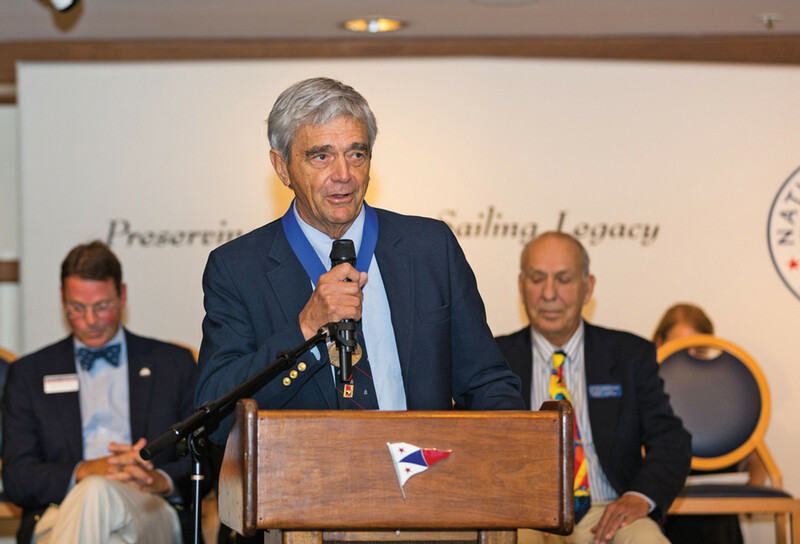 On Oct. 21, Mystic Seaport presented the brothers with its America and the Sea Award, and nine days later they were inducted into the National Sailing Hall of Fame in Annapolis, Md., with seven other sailing luminaries. Rod Johnstone addresses the gathering after his Hall of Fame induction. “Our strategy from day one was for our boats to be the best-performing boats of their kind out there, whether sail or power,” says Bob, who oversaw J/Boats’ business side. Bob attributes J/Boats’ success to their boats’ performance (fun to sail); their versatility (you can race, cruise and day-sail them); strict adherence to one-design specifications (design changes were discouraged); branding (all boats carry the same logo, the letter J with the model designation underneath); getting their dealers to go out and race the boats, meet people and market the boats (80 percent of the boats are sold because the buyer saw one sailing or a friend recommended it); and their ease of handling (many models have a retractable bowsprit and asymmetric spinnaker for short-handed sailing). J/Boats builds 13 models from 22.5 to 40 feet, and racing fleets continue to flourish. Company management has been turned over to a second generation of Johnstones, but Rod still helps design boats, and Bob, foreseeing baby boomers moving from sail to power as they age, founded MJM Yachts, which builds Down East-style performance cruisers that are economical to operate and have the latest technology, including joystick maneuvering and gyroscopic stabilization. This article originally appeared in the December 2016 issue.